Usersnap is a tool that allows web developers to easily get an annotated screenshot of bugs and then share it with the rest of the team or with third-party developers, as well as clients, colleagues, and quality assurance personnel. The platform effectively eliminates communication friction between developers and makes them more effective and productive in their work. The cloud-based Usersnap is directly embedded in the bug reporting and feedback loop, which then allows users to automatically send annotated screenshots of bugs and issues complete with the details, like browser information and operating system data. These screenshots are delivered via email or directly to developer’s system, be it a bug tracking platform or a project management system. Usersnap basically simplifies bug tracking and issue management and makes communication and collaboration faster, more effective, and more efficient between developers, clients, and quality assurance personnel. 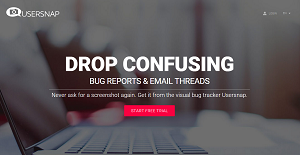 Point and click issue reporting makes bug tracking simpler and faster than ever. The feedback widget allows website users and developers to immediately send a bug report directly from the website. In-browser screenshots: you’ll get a screenshot of what your users sees. No plugins required. You can execute cross browser tests and see browser specific issues immediately. Collaborate & communicate: you can invite your colleagues into Usersnap and discuss screens and find solutions together. What Problems Will Usersnap Solve? People often find hard times discussing design drafts and website prototypes with colleagues and clients. Most of the time the feedback on design drafts is collected and discussed via email or phone. Since it’s hard expressing opinions on design via text, Usersnap which let’s you discuss and communicate visually within your browser. Customer support teams lack information needed to fix customer problems faster, since customers find it hard describing problems (e.g. which appeared on a website). With Usersnap, all information needed to reproduce a bug or error is automatically added to every bug report. There are popular and widely used applications in each software group. But are they automatically the best fit for your organization’s special requirements? A popular software solution may have thousands of customers, but does it provide what you require? For this reason, do not blindly spend on popular systems. Read at least a few Usersnap reviews and mull over the factors that you want in the software such as the fees, main functionality, available integrations etc. Then, shortlist a few solutions that fit your needs. Try out the free trials of these products, read online comments, get information from the maker, and do your investigation systematically. This in-depth groundwork is sure to aid you find the best software application for your firm’s special wants. We realize that when you make a decision to buy Customer Support Software it’s important not only to see how experts evaluate it in their reviews, but also to find out if the real people and companies that buy it are actually satisfied with the product. That’s why we’ve created our behavior-based Customer Satisfaction Algorithm™ that gathers customer reviews, comments and Usersnap reviews across a wide range of social media sites. The data is then presented in an easy to digest form showing how many people had positive and negative experience with Usersnap. With that information at hand you should be equipped to make an informed buying decision that you won’t regret. What are Usersnap pricing details? What integrations are available for Usersnap?